NASA's Cassini spacecraft captured this shot of Saturn's moon Enceladus on Aug. 18, 2015. A gorgeous new photo shows the varied terrain of Saturn's icy, ocean-harboring moon Enceladus. The image, which was taken on Aug. 18 by NASA's Cassini spacecraft from a distance of 85,000 miles (137,000 kilometers), dramatically shows that some parts of Enceladus' surface are much younger than others. "Newer surfaces (on the left in the image) will not have had time to accumulate craters. But as material sits exposed on the surface, impact scars build up, as in the more heavily cratered area on the top and right," NASA officials wrote in a description of the image, which was released Monday (Dec. 21). 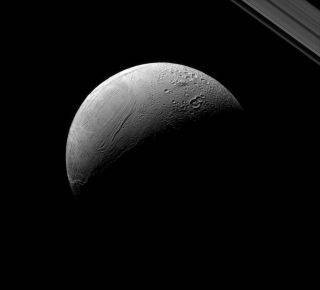 "Scientists can use this, along with estimates of how frequently impacts happen, to determine ages of surfaces of solid planets and of moons like Enceladus," agency officials added. Geysers blast material from this ocean into space from the moon's south polar region, allowing researchers to study the body of water without even touching down. Indeed, Cassini has flown through the moon's plume multiple times, and has detected carbon-containing organic molecules, the building blocks of life as we know it. Many researchers would like to take the next step and hunt for actual signs of life in the plume (which Cassini was not designed to do). Two different research teams have been developing concept missions to do just that. One of those concepts, called Enceladus Life Finder, would analyze captured plume particles on board, operating in the Saturn system; the other, known as Life Investigation for Enceladus, would return plume samples to Earth for study. Both missions remain concepts at the moment; neither one is on NASA's books. The $3.2 billion Cassini mission, a joint effort involving NASA, the European Space Agency and the Italian Space Agency, launched in 1997 and arrived in the Saturn system in 2004. Cassini will continue studying the ringed planet and its many moons through September 2017, when the probe will end its life with an intentional death dive into the planet's atmosphere.